Carbonara. Photo by Donna Turner Ruhlman. Michael just got back from an eventful James Beard Awards weekend in New York City, so today’s scheduled post has been delayed until tomorrow. So, I was looking back at the archives and I decided to rediscover his reflection on carbonara, his favorite pasta dish. 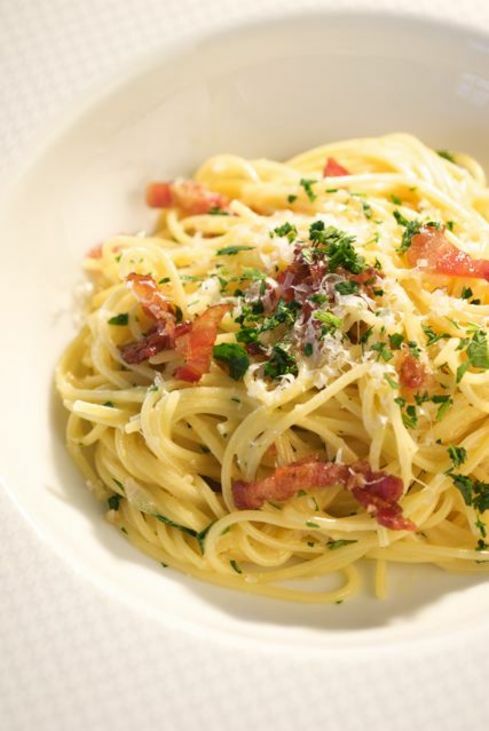 Not only is carbonara a great pasta dish, but it is an essential staple dish. I like that Michael mentions using cured mangalista belly instead of common bacon—that addition elevates carbonara to a different level. After posting a gorgeous fatty piece of cured mangalitsa belly I thought I should say how it first went to use. The other day I asked Donna to have lunch—one of the true pleasures of working from home. The house is clean and doesn’t thrum with kid energy, but most important, we’re not exhausted as we would be if we waited till the end of the day, so we can actually talk to one another about things that matter to us, reflectively and leisurely. I don’t want to spend more than 20 minutes or so actually cooking—a spinach salad with lardons, warm bacon fat and shallot dressing with a poached egg, or the above carbonara, which Donna clicked off before we sat down (she’d been shooting custards for me all morning so she was all set up). Carbonara is perhaps my favorite pasta, yet another variation of the bacon-and-eggs pairing, the simpler the better—don’t be snobby about the bacon cut (“Guanciale is the ONLY kind we use,” etc.—any good smoked bacon is excellent) and keep the frills like peas out of it. I think the only truly critical point is that you must use freshly grated reggiano. The fat is the pleasure in this mangalitsa bacon, so I wanted to use it all, tossing the strips of belly and all the rendered fat with the hot pasta, pouring the cream-yolk mixture over the hot pasta, which lightly cooks the sauce, tossing in some freshly grated reggiano, and finishing with chopped flat-leaf parsley. Serve it with a crusty baguette and a big zinfandel. Any couples out there with kids, I cannot recommend highly enough having lunch with your partner, in your home, in the middle of the week, on a regular basis. My past pasta post on making agnolotti. Learn more about the Mangalitsa or the wooly pig. Pigstock TC is the place to be in October 2013. We make this on special occasions and like to put a raw egg yolk in the middle like a birds nest. Need to try it with mangalista now, as our anniversary is near. Beautiful! Sorry, this is a Pecorino Romano dish. You can add a bit of Parmigiano Reggiano, but it’s not what this takes. And there should be a little more than a token amount of black pepper too..